Doing rather than just believing; and, in the context of spiritual practices, doing something the right way has its correlation with playing tennis. I can believe that practicing tennis will improve my game, but only by actually doing it over and over again do I really improve. And a belief – such as wearing a lucky t-shirt – may not be the reason I win a game whereas learning to change my backhand swing could make a big difference. Even a right belief, like believing in my tennis trainer’s advice, isn’t really enough to help me win the game; I need to really practice the new swing until it comes naturally in my game. If we are sophiological, we believe in the possibility of transformation; rather than being sinful people we are ignorant of our true identity. This transformation requires doing something, practicing a way of changing our mistaken identification with our lower nature so that we awaken to our true inner nature. This approach to life suggests that there are others who have become transformed by the recovery of their true identity and they can show us how to do as they were able to do. The path they describe requires right spiritual practices such as meditation. Whether we are Christian or not most of us are familiar with an image or idea of the Kingdom of Heaven. We know that Jesus talked a lot about the Kingdom of Heaven. But what did it really mean to him? 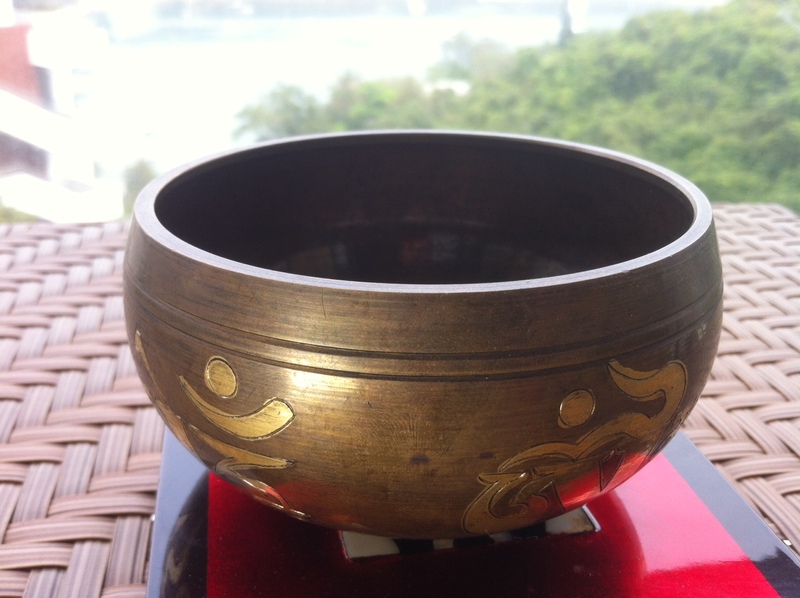 We have learned that through a practice of mindfulness we can develop a state of mind that is spacious and ’empty’ – and rings like a Tibetan ‘singing’ bowl in the analogy I demonstrated in class. As you will recall, the bowl represents your life. It is beautifully crafter and designed to ring true. If you stuff it full with ‘the things of this world,’ it only makes a dull thud when struck. But if you develop a state of mind that is spacious, that does not cling to the ‘things’ of your life, there is plenty of room inside the bowl – like Dr. Who’s Tardis – and it will ring true. The ‘things’ in your life remain, but you ‘hold’ them within a spaciousness that allows your true identity to ring forth. This is achieved by practicing being in the present moment and observing the contents of our hearts and minds rather than identifying with them and letting them carry us away from our true selves. In this way we begin to see, to identify with the underlying unity of all things. We begin to transcend our ordinary consciousness and transform our minds and hearts; we develop the capacity for compassion (see R. Davidson) as we begin to see others ‘as ourselves’ (meaning literally, the same Being as myself, no separation). Whether we are religious or not, all of us have many beliefs that we don’t put into practice. We may believe that being involved in service activities will help change the world, or being environmentally aware will reverse global warming but how often do we actually practice these good intentions? Perhaps it is because we don’t have a practice that generates the capacity for compassion – for seeing someone as my own self in the sense that we are the same universal Being. One thing we probably all agree to believe is that we need a more compassionately oriented world. That will come from individual people developing the capacity for compassion and selflessness. We want to create ‘the Kingdom of Heaven’ on earth but we can’t do that by believing in it, we need to do it by practicing it – by entering the state of non-dual consciousness that Wisdom Teachers, like Jesus, have always prescribed. We need a practice of mindfulness that transforms our consciousness so we can help others transform their consciousness, too.